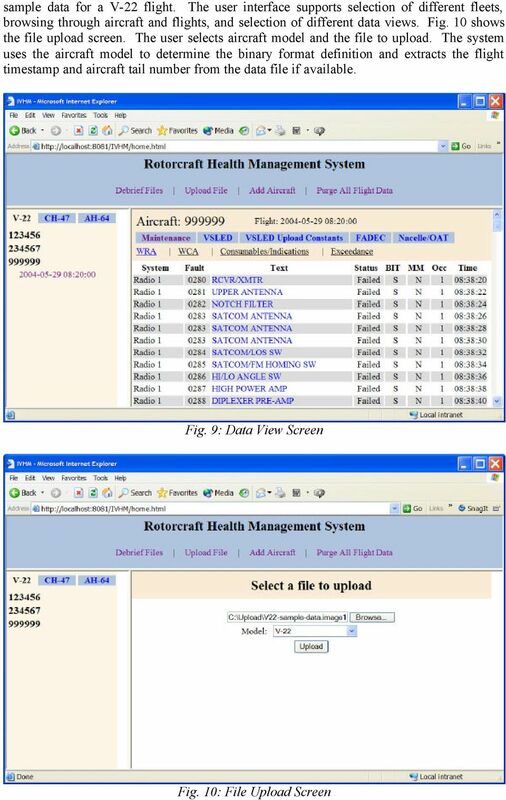 Download "Rotorcraft Health Management System (RHMS)"
2 Data management tools include support for storing, retrieving and managing health data. Data interchange and data processing support tools include data presentation specification for defining data input and output of health monitoring modules, interface specification for data providers and consumers, and support for workflow definition for health monitoring processes. 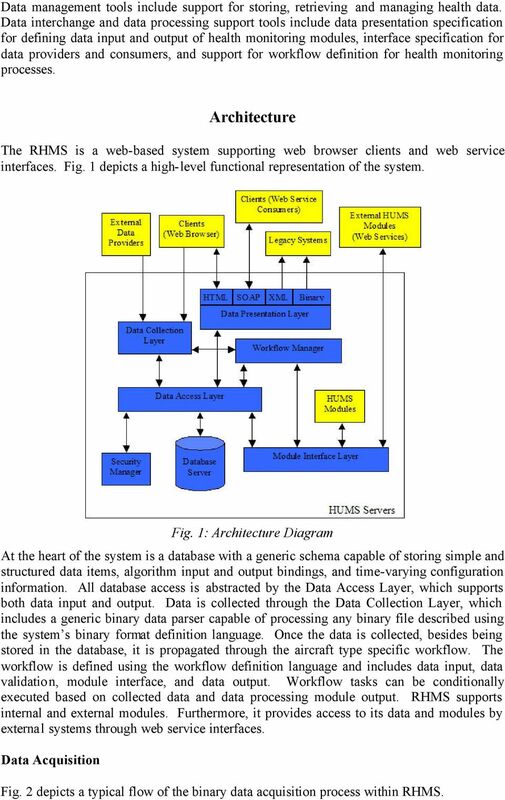 Architecture The RHMS is a web-based system supporting web browser clients and web service interfaces. Fig. 1 depicts a high-level functional representation of the system. Fig. 1: Architecture Diagram At the heart of the system is a database with a generic schema capable of storing simple and structured data items, algorithm input and output bindings, and time-varying configuration information. All database access is abstracted by the Data Access Layer, which supports both data input and output. Data is collected through the Data Collection Layer, which includes a generic binary data parser capable of processing any binary file described using the system s binary format definition language. Once the data is collected, besides being stored in the database, it is propagated through the aircraft type specific workflow. The workflow is defined using the workflow definition language and includes data input, data validation, module interface, and data output. Workflow tasks can be conditionally executed based on collected data and data processing module output. 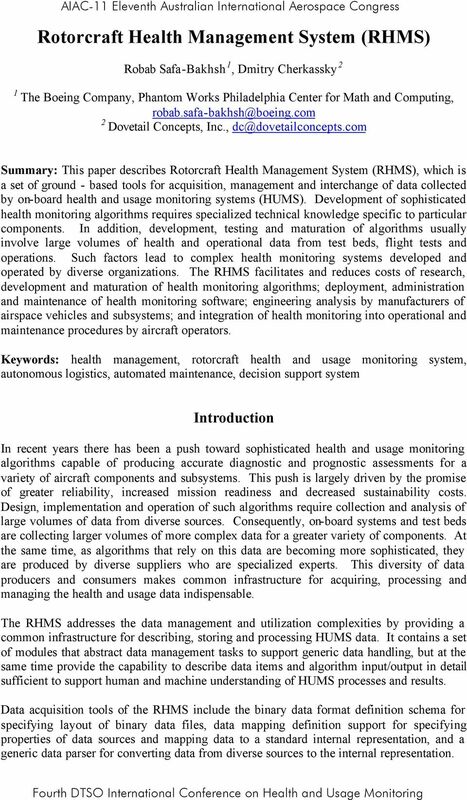 RHMS supports internal and external modules. Furthermore, it provides access to its data and modules by external systems through web service interfaces. Data Acquisition Fig. 2 depicts a typical flow of the binary data acquisition process within RHMS. 3 Fig. 2: Binary Data Acquisition Process HUMS data acquired from diverse sources, such as onboard and external systems come in a variety of formats. The collected data is usually in binary formats. Often these formats undergo changes as systems mature. 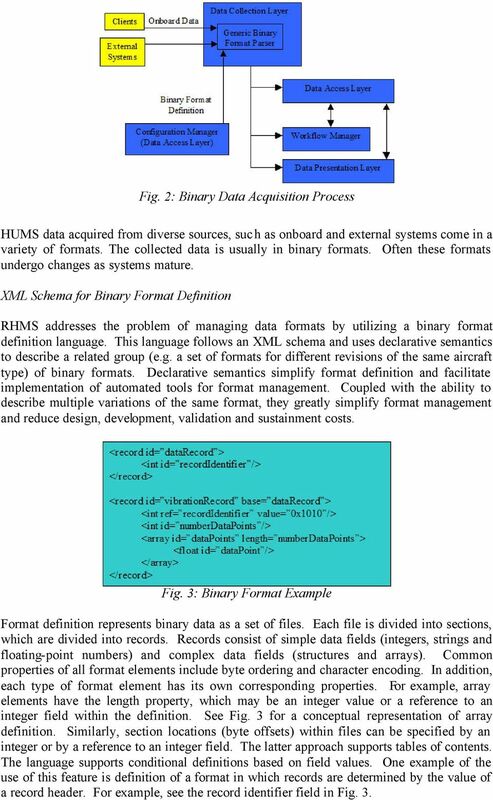 XML Schema for Binary Format Definition RHMS addresses the problem of managing data formats by utilizing a binary format definition language. This language follows an XML schema and uses declarative semantics to describe a related group (e.g. a set of formats for different revisions of the same aircraft type) of binary formats. Declarative semantics simplify format definition and facilitate implementation of automated tools for format management. Coupled with the ability to describe multiple variations of the same format, they greatly simplify format management and reduce design, development, validation and sustainment costs. Fig. 3: Binary Format Example Format definition represents binary data as a set of files. Each file is divided into sections, which are divided into records. Records consist of simple data fields (integers, strings and floating-point numbers) and complex data fields (structures and arrays). Common properties of all format elements include byte ordering and character encoding. In addition, each type of format element has its own corresponding properties. For example, array elements have the length property, which may be an integer value or a reference to an integer field within the definition. See Fig. 3 for a conceptual representation of array definition. Similarly, section locations (byte offsets) within files can be specified by an integer or by a reference to an integer field. The latter approach supports tables of contents. The language supports conditional definitions based on field values. One example of the use of this feature is definition of a format in which records are determined by the value of a record header. For example, see the record identifier field in Fig. 3. 4 Fig. 4: Data Acquisition Example RHMS includes a generic data parser, which is capable of processing any binary data format given its definition. Therefore, adding a new version of an existing format or integrating a new format into the system only requires generation of an XML definition file and possible addition of configuration information. When binary files stored in this format are processed, the parser utilizes the format definition to read and validate the data. After the data is validated, it is stored in the database and processed by the Workflow Manager. A sequence diagram representing a simple data acquisition example is depicted in Fig. 4. Work Flow Manager The workflow manager utilizes XML workflow definition files, which define actions to be taken based on the source and contents of the data. Workflow actions may include event and alert generation, requests for additional data input and data validation, data file generation, and module execution. 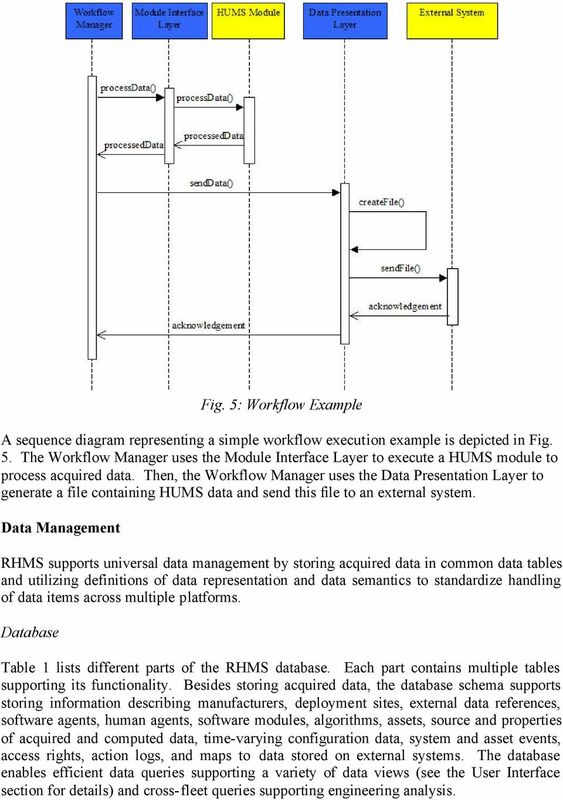 Workflow Manager facilitates data processing and integration of HUMS modules. 5 Fig. 5: Workflow Example A sequence diagram representing a simple workflow execution example is depicted in Fig. 5. The Workflow Manager uses the Module Interface Layer to execute a HUMS module to process acquired data. Then, the Workflow Manager uses the Data Presentation Layer to generate a file containing HUMS data and send this file to an external system. Data Management RHMS supports universal data management by storing acquired data in common data tables and utilizing definitions of data representation and data semantics to standardize handling of data items across multiple platforms. Database Table 1 lists different parts of the RHMS database. Each part contains multiple tables supporting its functionality. Besides storing acquired data, the database schema supports storing information describing manufacturers, deployment sites, external data references, software agents, human agents, software modules, algorithms, assets, source and properties of acquired and computed data, time-varying configuration data, system and asset events, access rights, action logs, and maps to data stored on external systems. The database enables efficient data queries supporting a variety of data views (see the User Interface section for details) and cross-fleet queries supporting engineering analysis. 7 supports generation of their input and control files, as well as processing of and utilization of data from their output files. This process is shown in Fig. 6. Service Module Interface Fig. 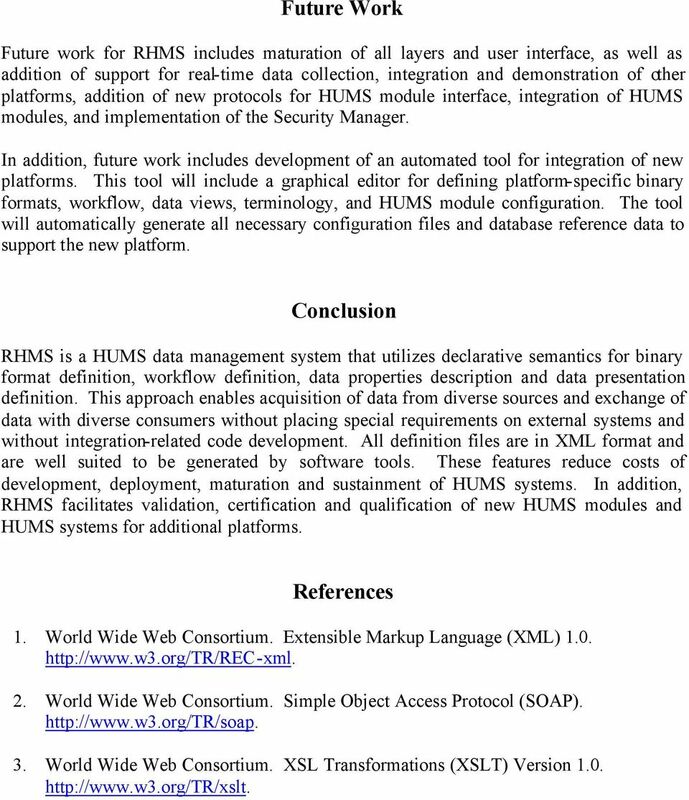 6: Standalone Module Execution RHMS defines web service interfaces for HUMS data access. 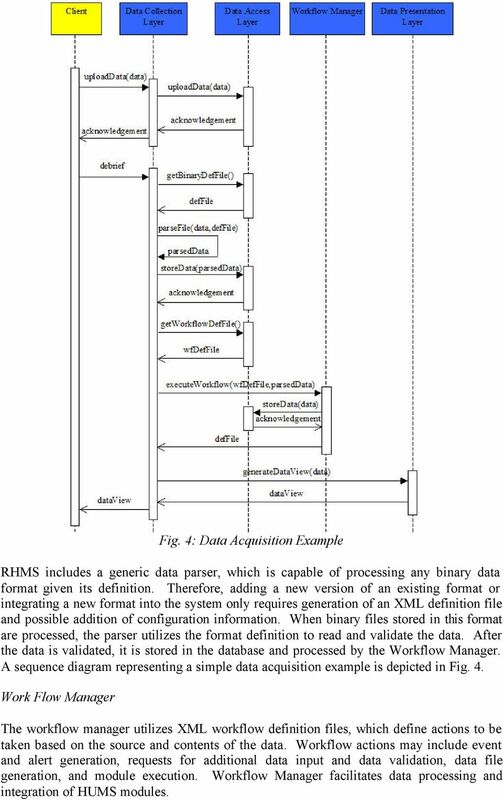 It implements web services that can be utilized to access HUMS data and consumes web services implemented by HUMS algorithm suppliers (see Fig. 7). Fig. 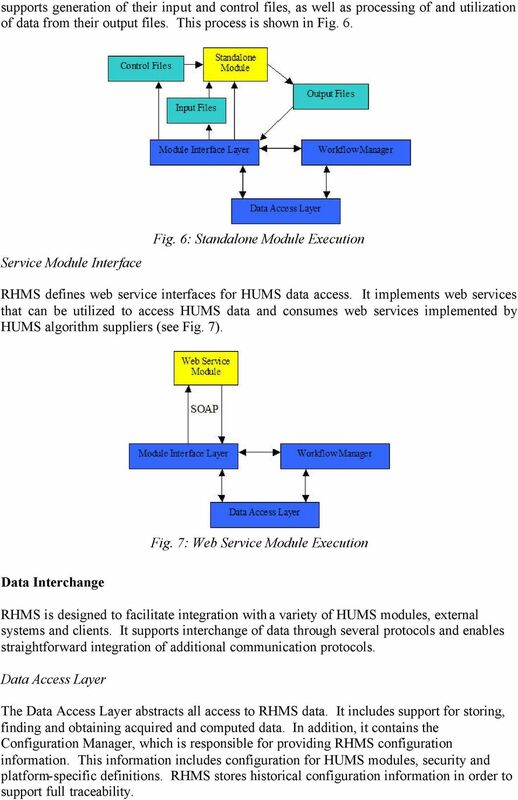 7: Web Service Module Execution Data Interchange RHMS is designed to facilitate integration with a variety of HUMS modules, external systems and clients. It supports interchange of data through several protocols and enables straightforward integration of additional communication protocols. Data Access Layer The Data Access Layer abstracts all access to RHMS data. It includes support for storing, finding and obtaining acquired and computed data. In addition, it contains the Configuration Manager, which is responsible for providing RHMS configuration information. 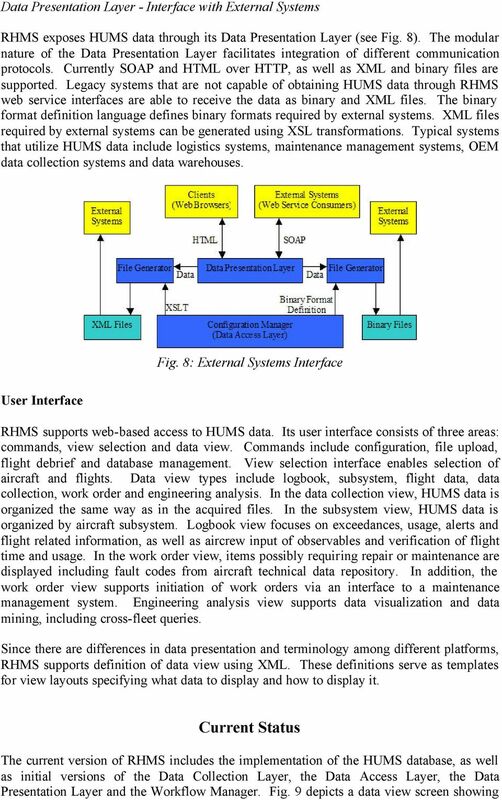 This information includes configuration for HUMS modules, security and platform-specific definitions. RHMS stores historical configuration information in order to support full traceability. CHAPTER 6 Chapter Goal Become familiar with the basic functions of a network management system. Introduction This chapter describes functions common to most network-management architectures and protocols. Smart Travel Guide: Application for Android Mobile Dadape Jinendra R. Jadhav Bhagyashri R. Gaidhani Pranav Y. Vyavahare Seema U. AchaliyaParag N.
Firewall Builder Architecture Overview Vadim Zaliva Vadim Kurland Abstract This document gives brief, high level overview of existing Firewall Builder architecture. Web. Services. Web Technologies. Today. Web. Technologies. Internet WWW. Protocols TCP/IP HTTP. Apache. Next Time. Lecture #3 2008 3 Apache. Multifunctional Barcode Inventory System for Retailing. Are You Ready for It? vcloud Air Platform Programmer's Guide vcloud Air OnDemand 5.7 This document supports the version of each product listed and supports all subsequent versions until the document is replaced by a new edition. SECURE ICAP Gateway. Blue Coat Implementation Guide. Technical note. Version 1.0 23/12/13. Product Information. Version & Platform SGOS 6.